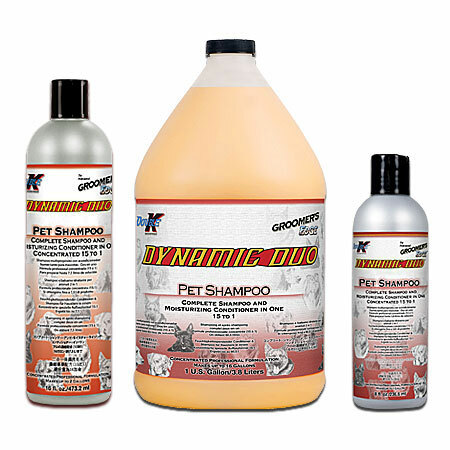 DYNAMIC DUO® combines a rich shampoo with a super conditioner to cut bathing time in half! No need to follow with a separate conditioner or rinse. Luxurious formula is fortified with Panthenol, Aloe and Vitamin E. Lathers well and rinses easily, leaving hair easy to comb out, with spectacular shine. Mild and specially pH balanced for pets. Rich formula is gentle and may be used regularly for show ring results. Great for groomer’s/bather’s hands. For use on dogs, cats, puppies, kittens and all companion and farm animals.